IKEA Swedish Meatballs is the item you must eat when you are visiting IKEA, some people going to IKEA just to eat this meatballs. In Indonesia, people went crazy when IKEA first open in Alam Sutera, Tangerang, suburb of Jakarta. They are queuing up on IKEA restaurant to buy this babies, and the restaurant is always packed during lunch time or weekends. 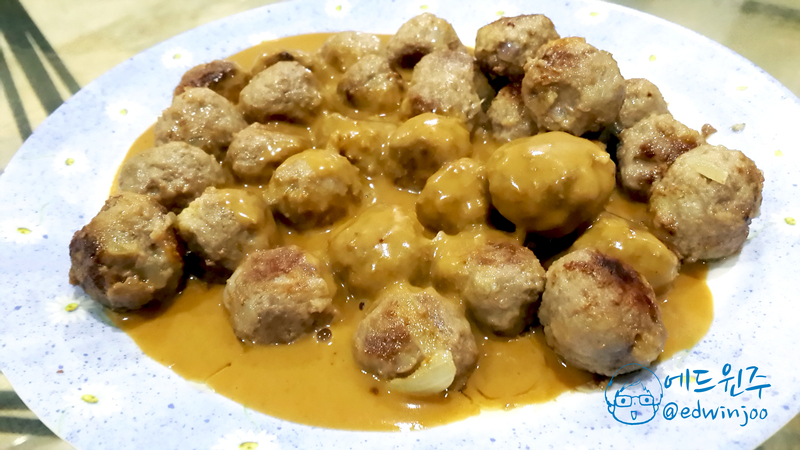 After going there three times, about 40-minute drive from my house, I think I need to make my own Swedish meatballs, well basically, it is a meatballs but not like meatballs that Indonesian used to eat, there are still meaty texture to it. And by the way, in my recipes it contains pork meat, because I found out that why the Indonesian IKEA meatballs is so tiny compare to Singapore, Thailand or Shanghai’s, because it does not contain pork meat, just beef, I don’t know what can’t the meatballs the same size, may be the cost just too high while they are selling it cheap, but I think my meatballs is cheaper than the IKEA one. 200 – 300 ml heavy cream/full cream milk for mashed potato. demi-glace powder, you can buy it in supermarket but in huge quantity. clean the skin of the potatos, cut into wedges. rinse it, add salted butter/margarine while the potato still steaming hot. mix well, add salt and pepper to taste. cover it with plastic wrap and leave it aside. chopped the onions into small size, then saute it with unsalted butter until it soften, do not burn it. make a small size round balls, put it on a tray first. add little cooking oil to a nonstick pan in a small fire. put the meatballs to the pan, pan fry the balls in a medium fire, don’t forget to turn side. cook it for around 10-15 minutes or until you think its cooked. I make the ball in a small size so the meatball can cook faster. but don’t cook it until it dried, keep it juicy. Put into the plate with your mashed potato then pour your sauce. add 5 spoon of demi-glace powder to a pan, add water (not hot) whisked it until it dissolved, then turn on the fire in medium. Keep on stirring, add heavy cream little by little, until it thickened, add a little hot water so the sauce is not so thick but I want it to be creamy saucy. Taste it, if it is too salty, add more hot water. I’m sorry if my recipe is quite confusing, it is my first time writing down a recipe, usually i cook without using any recipes, just using my feeling. Hope you can make it! Comment below if you can do it or you can ask me any questions.